Herbes de Provence is a classic blend of flavors that originates, from the Provence region of France – famous for its fragrant lavender fields. This Herbes de Provence Beast Bowl is a fantastic and easy way to liven up your weekly food prep routine. Herbes de Provence seasoning blend is made up of a mixture of thyme, tarragon, sage, marjoram, savory, and lavender. Herbes de Provence tastes great on roasted chicken, fish, and vegetables. If you’ve never used it before, hold onto your shirt. This distinctive blend may quickly become one of your go-to seasonings. This seasoning mix also makes a fantastic chicken salad. A few teaspoons of Herbes de Provence adds a unique flavor to chicken salad; not to mention it also tastes absolutely amazing on a really nice piece of toasted sourdough! I’m asking myself right now why I don’t have any leftover chicken in the fridge to whip up a batch of chicken salad. This Beast Bowl recipe is the first time that I am talking about specifically using leftovers for a Beast Bowl. 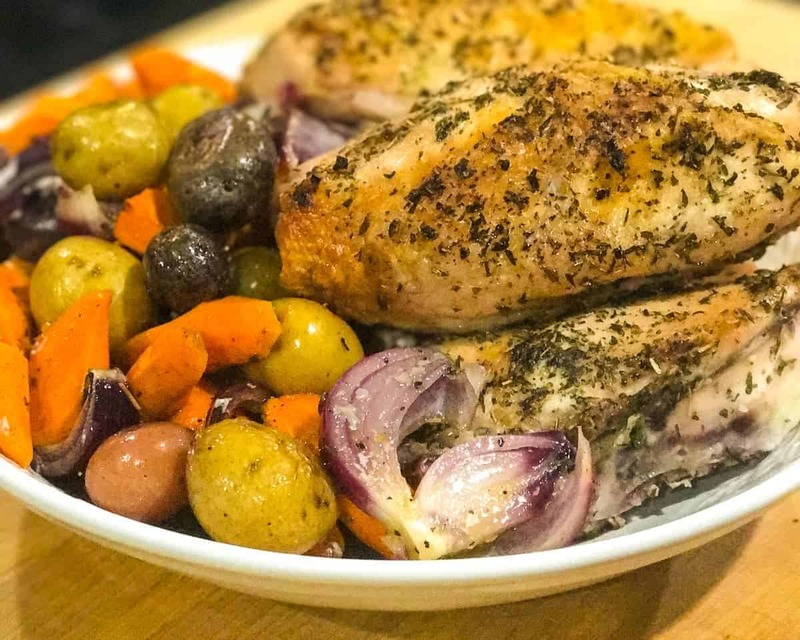 This roasted chicken and vegetable dinner is made in one roasting pan. The leftovers are used to prep Beast Bowls all week. The way that I game my meal prep is by making a beautiful dinner of roasted chicken and vegetables on the weekend. In addition, I go ahead and make a big batch of blanched green beans to go with this dinner. I plan ahead and make sure that I have made enough chicken and roasted vegetables to have enough for packing my lunch all week. I usually cook twice on the weekend and make sure that my leftovers are Beast Bowl friendly. 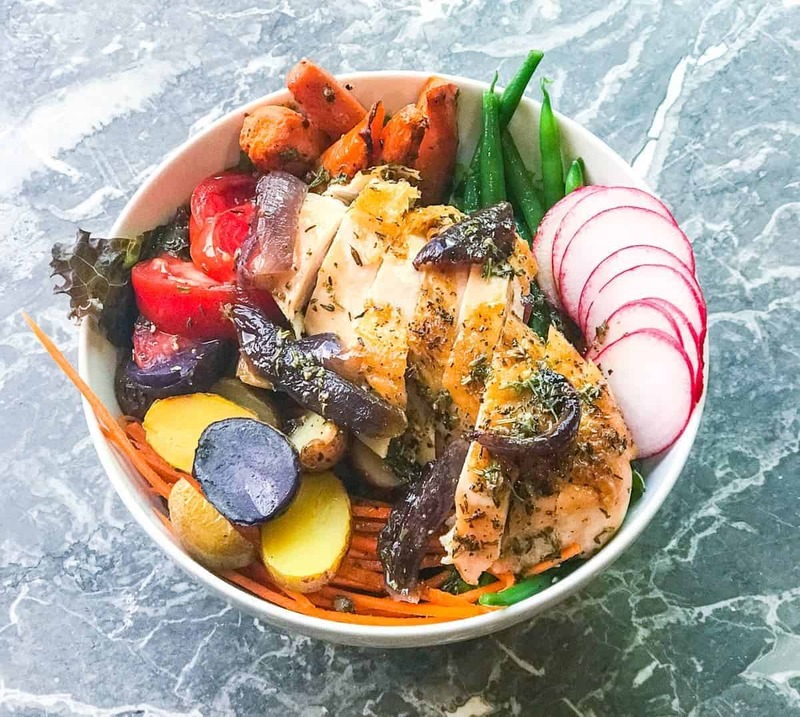 Herbes de Provence roasted chicken and vegetables top this flavorful fall beast bowl. Prepare vegetables and put them in a roasting pan. Sprinkle chicken with herbs de Provence, salt and a little oil. Place chicken on a roasting rack above the vegetables. Bring about 6 cups of water with 2 large tbsp of salt to a boil. Get a large bowl of ice water ready and set aside. Once water is boiling add green beans and boil for about 4 minutes. Remove and place immediately into ice water. Strain liquid off. Add your choice of suggested fixin's to the bowl. Add a little bit of vinaigrette. Top with sliced roasted chicken and roasted veggies.